I’m back with a video for you today and I am playing with Brusho. Along with that, I do some simple Copic colouring and I have a couple of great tips for you for aligning dies when you have images with long stems! Coordinating dies can be very tricky to line up with stamps that have some wiggle in them and I have a couple of ways to make things easier for you. For those of you that watched my recent haul video, you will know that I got the beautiful Altenew Wonderland set recently and that is what features in today’s video. So here is a snapshot of the cards I have created for today’s video. And here is the video for you, but I have also provided a quick description below of how the cards were created. The Brusho was added to two watercolor cardstock panels in two different ways. The first was by dropping it onto the panel and spritzing with water and letting the water move the pigment about. The second was to add the water first and then sprinkle the Brusho on top, adding more water if necessary. Both work equally as well. The panels were left to air dry. 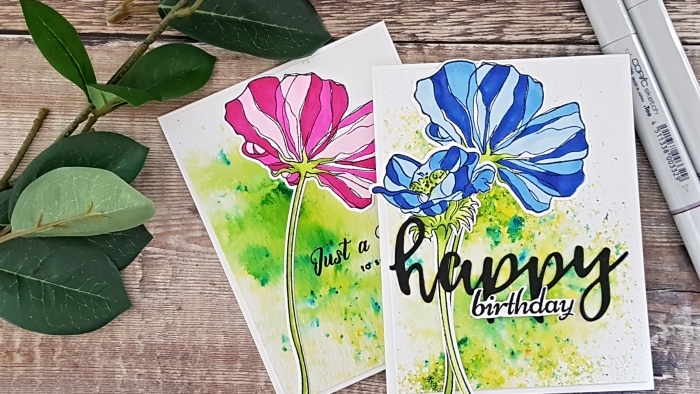 Whilst drying I stamped the floral images onto Neenah 110 and did some very basic Copic colouring and then cut them with the coordinating dies. These stamps I think are wonderful with any medium but I wanted the contrast of Copics versus Watercolour today. 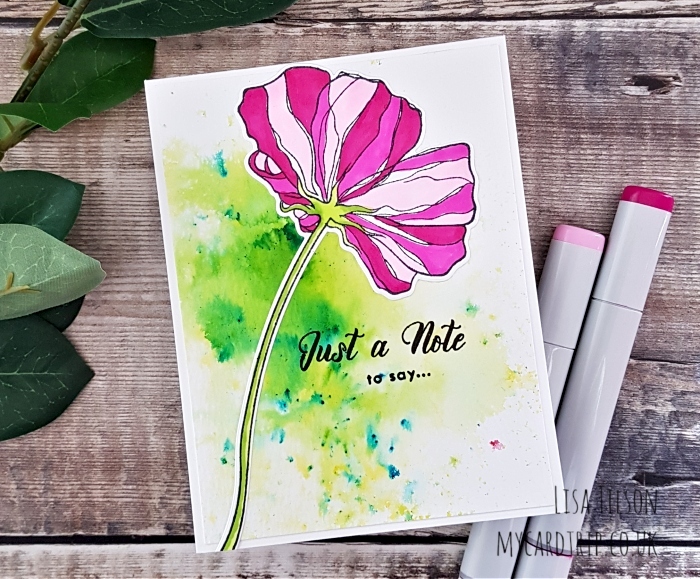 I adhered the floral images with Studio Katia glue onto the panels and then stamped a sentiment from the Wonderland set to the pink floral card. 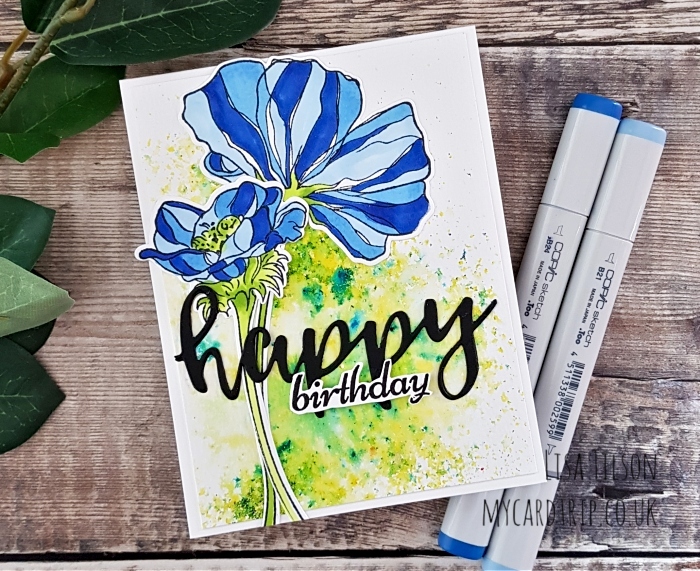 For the blue floral card, I die cut the word happy from Altenew Script Words 2 twice, adhered them together and then glued that onto the top of the flowers. The “birthday” sentiment is from Altenew Tulip and it was stamped and fussy cut before popping up with foam tape. I do hope that you found the video useful and it may encourage you to get out your powders for a little bit of messy fun. I believe that Ken Oliver powders are similar but I don’t have those to compare. Give whatever you have a try – it’s fun to watch the reaction of pigment vs water. Thank you for joining me today. I hope you had a great weekend and I wish you a wonderful week ahead. Happy crafting! The cards are beautiful. Many thanks for the trick about die cutting the stems! Beautiful cards. Thank you for the great tips.